Institutional advising services 24 hours a day, seven days a week, designed to align with blockchain’s always-on trading cycle. This may sound like the same news you hear about from other firms (like ErisX which we covered last week), or just some news that may not impact you directly, but believe us when we say, this is a big deal. We’ll let Mike Novogratz explain why in this interview with Bloomberg. With only the first customers onboarding right now and general availability scheduled for early 2019, we don’t expect this news to impact the market in the short term. However, this is a clear indication of the desire from family offices, hedge funds, other sophisticated investors to begin investing in the space. The firm has no plans to extend the trading of bitcoin to retail customers… for now, at least. After announcing more than 6 months ago that they would be listing ERC-20 tokens, Coinbase reported last week that it would add the 0x protocol token, ZRX for trading. The announcement led to a more than 30% price jump. Longtime readers will remember that Coinbase had previously announced that they were looking to potentially add five tokens to their trading platform, including 0x (ZRX), Cardano (ADA), Basic Attention Token (BAT), Stellar Lumens (XLM) and Zcash (ZEC) – giving us some indication of what tokens will be added next. Like any crypto announcement, people were quick to jump on the news with some skepticism. Namely the fact that individuals such as the co-founder at Coinbase along with their first-ever hire are advisors to 0x. The notorious stablecoin, Tether (UDST), was anything but stable this past week. The cryptocurrency designed to be pegged 1-for-1 with the U.S. dollar fell from its peg, trading for as low as $0.85. We currently don’t know exactly the cause for the break, but the main theory is that the occurrence correlated to Tether’s recent banking woes. While this may be a warning sign that USDT is in trouble, it also could just be paranoia among investors. Nonetheless, USDT’s reputation must improve if it wishes to remain the dominant player in an ever-growing sea of stablecoins. Who knows, maybe we should start anticipating on what could happen months from now. If Tether does collapse, what do you think will happen to the demand of bitcoin? Not sure? Well imagine if you had 1,000 USDT in your exchange account and abruptly found that the price was falling. If you want to make serious money and protect your assets, then you need to think and invest like the best in the business. Real Vision, a subscription video channel, delivers exclusive in-depth interviews, macro-theme documentaries, trade ideas and deep dive analysis from the world’s smartest hedge fund managers, geopolitical analysts and investors. Be a part of the conversion with investment legends such as Kyle Bass, Jeff Gundlach, Peter Brandt, Mark Cuban, Rick Rule, Jim Grant, and many, many more for FREE, for 14 days. Try us and find out why thousands of subscribers from over 100 countries have signed up to Real Vision and give us a rating of ‘5 Star Excellent’ on Trust Pilot. For a limited time only, get access to Business Insider Prime for 1 year when you start a 14-day trial. There has recently been a lot of FUD (Fear, Uncertainty, Doubt – for all you newcomers) around the idea that “Crypto Whales” (wallets with hundreds of thousands of bitcoins) may decide to disrupt the crypto market through the selling of their assets at any given time. After analyzing the transactional history of the 32 largest bitcoin wallets though, Chainalysis’ data suggests just the opposite. 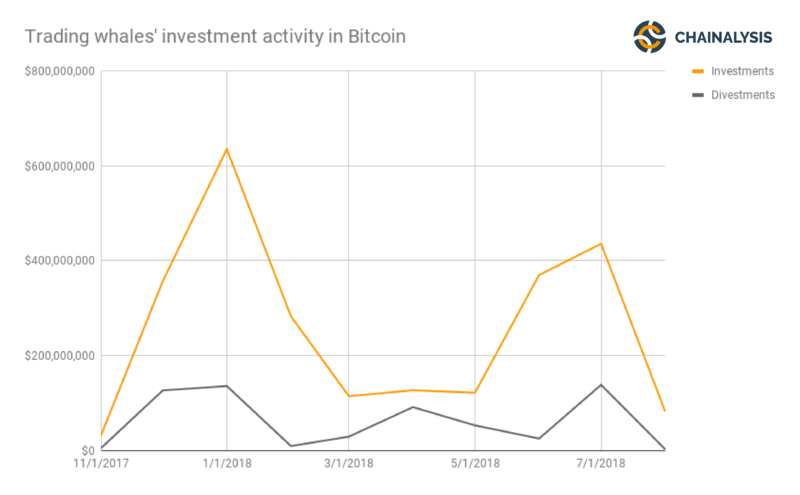 Although these whales certainly have the capability of executing transactions large enough to move the market, they were actually net purchasers of bitcoin during the major price decline this year. This indicates that trading whales were actually a stabilizing rather than destabilizing the market after all. Let’s take a step back: With the creation of bitcoin’s blockchain came the fact that every transaction sent was tied to a public address. But if you bought your bitcoin from a service like Coinbase that’s attached to your real name, your transactions can be linked back to your identity. So to combat this, a number of so-called privacy coins were created. These coins focused on secure and anonymous transactions. But just because a coin self-advertises as “private” doesn’t mean that it actually is. And thankfully for us, we have guys like Peter Kwang breaking down which coins are the best at giving their owners true privacy, and which ones are just cryptic examples of false advertising. As we covered last week, Nouriel Roubini and Peter Van Valkenburgh duked it out over the topic of cryptocurrencies and the blockchain ecosystem. As expected, the debate caused a lot of reactions among the crypto community. We appreciate Chris Burninske (read his books, folks 📚) for taking a step back and explaining why although the crypto community may not agree with Nouriel, intolerance kills off the diversity of ideas. 🚫 Why Isn’t Bitcoin Banned Everywhere? Bitcoin was supposed to be the enemy of governments, it was supposed to create a parallel, uncensorable economy. If that’s true, then why have most governments ushered Bitcoin through the front door? Just because of the name alone this is a coin you should be interested in (kidding). 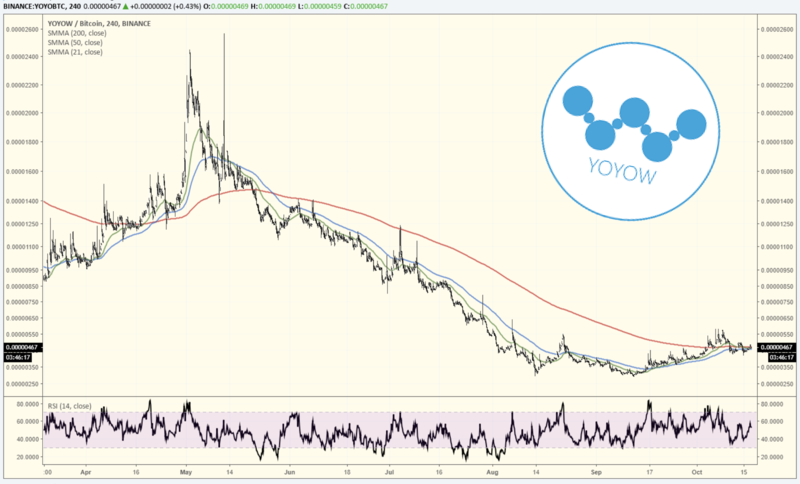 But seriously, (YOYOW) is moving in a upward direction, and is showing a descending triangle. With a flattened & bullish extended consolidation, as well as a strengthening RSI, we see YOYOW as a cryptocurrency that is due to jump. 📌 The Looming Threat of China & Bitcoin, Yale Invests in Crypto, and Coinbase’s $12 Billion Valuation?